4. 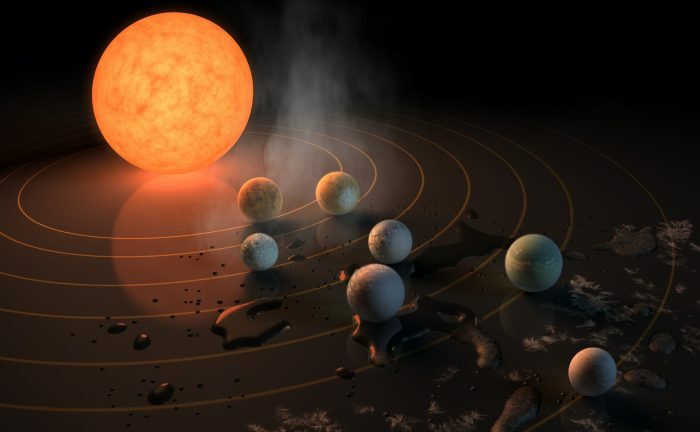 Supernova condensate – Exactly how big is the TRAPPIST-1 system? 5. Universe Today – Some Active Process is Cracking Open These Faults on Mars. But What is it? 7. 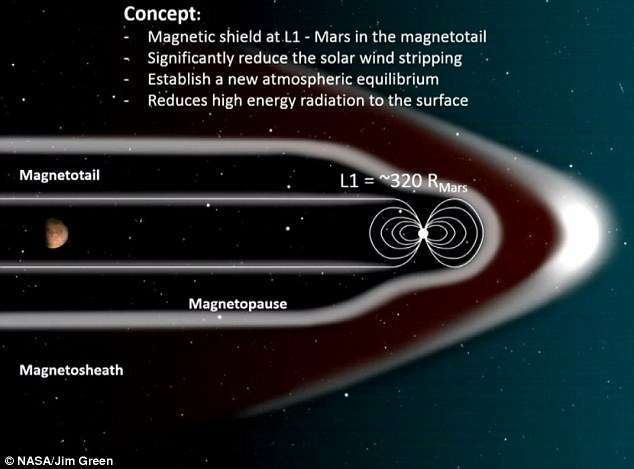 Nextbigfuture – An inflatable structure(s) can generate a magnetic dipole field at a level of perhaps 1 or 2 Tesla (or 10,000 to 20,000 Gauss) as an active shield against the solar wind and allow the Martian atmosphere to thicken overtime. Mars atmosphere would naturally thicken over time, which lead to many new possibilities for human exploration and colonization. According to Green and his colleagues, these would include an average increase of about 4 °C (~7 °F), which would be enough to melt the carbon dioxide ice in the northern polar ice cap. This would trigger a greenhouse effect, warming the atmosphere further and causing the water ice in the polar caps to melt. By their calculations, Green and his colleagues estimated that this could lead to 1/7th of Mars’ oceans – the ones that covered it billions of years again. These new conditions on Mars would allow human explorers and researchers to study the planet in much greater detail and enable a truly profound understanding of the habitability of this planet. If this can be achieved in a lifetime, the colonization of Mars would not be far away. The proposed Lagrange point system would not require massive amounts of superconducting cable with gigawatt generators. 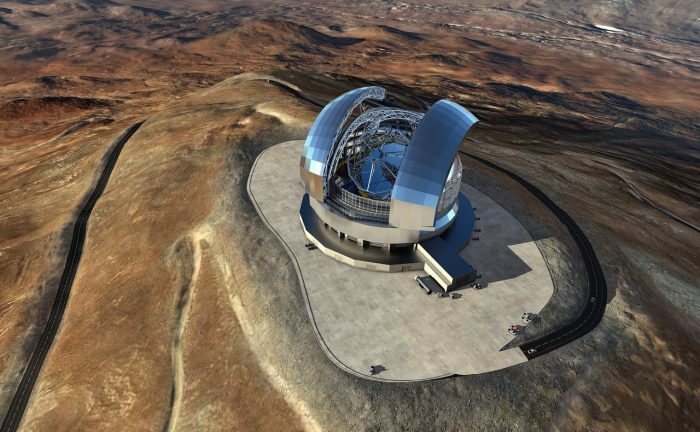 It would be a much smaller shield between the Sun and Mars. 2 Tesla magnets are easily produced. 8. Nextbigfuture – In 2014 at a SF and comic convention Joe Flanigan (who played John Sheppard on the Stargate Atlantis show) revealed that he and a group of investors tried to lease the rights to the Stargate Franchise. There was an verbal agreement on terms for a ten year deal but it could not be concluded because of the bankruptcy of MGM. 9. Nextbigfuture – SpaceX has been approached to fly two private citizens on a trip around the moon late next year. They have already paid a significant deposit to do a moon mission. Like the Apollo astronauts before them, these individuals will travel into space carrying the hopes and dreams of all humankind, driven by the universal human spirit of exploration. Spacex expects to conduct health and fitness tests, as well as begin initial training later this year. Other flight teams have also expressed strong interest and Spacex expects more to follow. Additional information will be released about the flight teams, contingent upon their approval and confirmation of the health and fitness test results. Spacex would like to thank NASA, without whom this would not be possible. NASA’s Commercial Crew Program, which provided most of the funding for Dragon 2 development, is a key enabler for this mission. In addition, this will make use of the Falcon Heavy rocket, which was developed with internal SpaceX funding. Falcon Heavy is due to launch its first test flight this summer and, once successful, will be the most powerful vehicle to reach orbit after the Saturn V moon rocket. At 5 million pounds of liftoff thrust, Falcon Heavy is two-thirds the thrust of Saturn V and more than double the thrust of the next largest launch vehicle currently flying. 10. 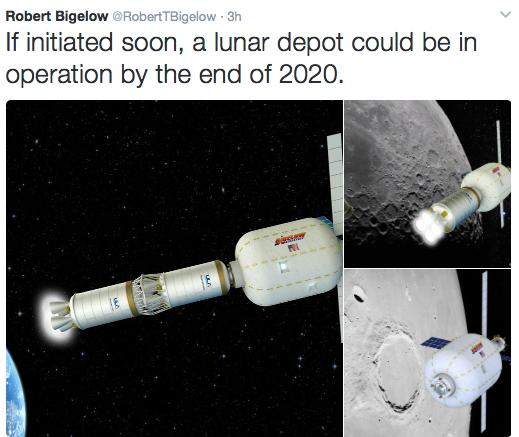 Nextbigfuture – Bigelow Aerospace founder Robert Bigelow‘s company makes in-space habitats. One (the BEAM adds 16 cubic meters of living area to the ISS) is now attached to the International Space Station and he and his company are developing permanent, stand-alone habitats to serve as private space stations in orbit around the Earth, ready to house private astronauts. Bigelow has talked with United Launch Alliance Chief Executive Tory Bruno about using the company’s Atlas V 552 rocket, which has an extra-wide payload fairing, to deliver the B330 into orbit. United Launch Alliance is developing an advanced upper-stage vehicle, ACES, to provide in-space propulsion. Bigelow has spoken SpaceX President Gwynne Shotwell about using the company’s Dragon 2 spacecraft to transport astronauts to the B330 in deep space. By 2020, NASA and commercial astronauts could be living and working in lunar orbit inside a functional space station that would be about half of the volume of the international space station. 11. Nextbigfuture – Jeff Bezos and Blue Origin have been circulating a seven-page white paper to NASA leadership and President Trump’s transition team about their interest in developing a lunar spacecraft with a lander that would touch down near a crater at the south pole where there is water and nearly continuous sunlight for solar energy. The memo urges the space agency to back an Amazon-like shipment service for the moon that would deliver gear for experiments, cargo and habitats by mid-2020, helping to enable “future human settlement” of the moon. Blue Origin’s proposal, dated Jan. 4, doesn’t involve flying humans, but rather is focused on a series of cargo missions. Those could deliver the equipment necessary to help establish a human colony on the moon — unlike the Apollo missions, in which the astronauts left “flags and footprints” and then came home. The United Launch Alliance, the joint venture of Boeing and Lockheed Martin, has also been working on plans to create a transportation network to the area around the moon, known as cislunar space. The Blue Moon spacecraft could carry as much as 10,000 pounds of material and fly atop several different rockets, including NASA’s Space Launch System, the United Launch Alliance’s Atlas V or its own New Glenn rocket, which is under development and expected to fly by the end of the decade, the company said. The FCC had given companies until March 1 to disclose whether they also had plans to use the same V-band that Boeing had applied for in November of last year. The five companies — SpaceX, OneWeb, Telesat, O3b Networks and Theia Holdings — all told the FCC they have plans to field constellations of V-band satellites in non-geosynchronous orbits to provide communications services in the United States and elsewhere. So far the V-band spectrum of interest, which sits directly above Ka-band from about 37 GHz to the low 50 GHz range, has not been heavily employed for commercial communications services. * Boeing has a proposed global network of 1,396 to 2,956 low-Earth orbit (LEO) satellites for providing connectivity. * SpaceX, for example, proposes a “VLEO,” or V-band low-Earth orbit (LEO) constellation of 7,518 satellites to follow the operator’s initially proposed 4,425 satellites that would function in Ka- and Ku-band. * OneWeb told the FCC it wants to operate a “sub-constellation” of 720 LEO V-band satellites at 1,200 kilometers, and another constellation in Medium Earth Orbit (MEO) of 1,280 satellites. * Canada-based Telesat describes its V-band LEO constellation as one that “will follow closely the design of the Ka-band LEO Constellation,” also using 117 satellites (not counting spares) as a second-generation overlay.